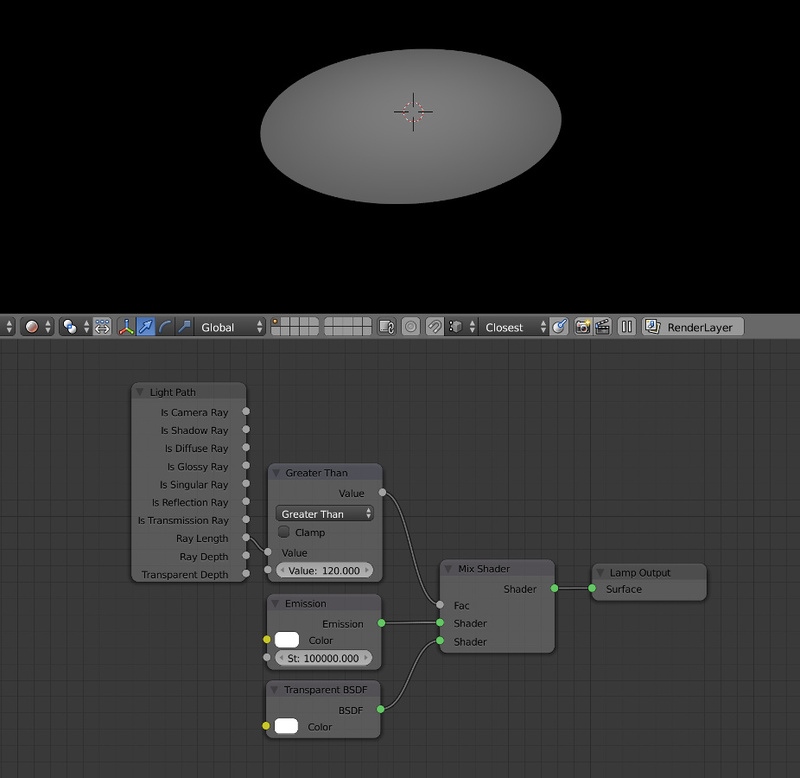 I can make a light not illuminate things further away than a set distance, using the attached node setup. Is there a way to refine this setup so that the light intensity can be controlled between the light source and the set distance, with a gradient? I do understand that there is a light falloff node. I need a way to control not only falloff but also the distance where the light stops illuminating the scene (physically non realistic light). I came up with the below node setup. As qwazix pointed out, the divide value of 60 is actually the distance in system units from the light source to where the light stops affecting the scene. You can use the ColorRamp to visually modify the attenuation across space. 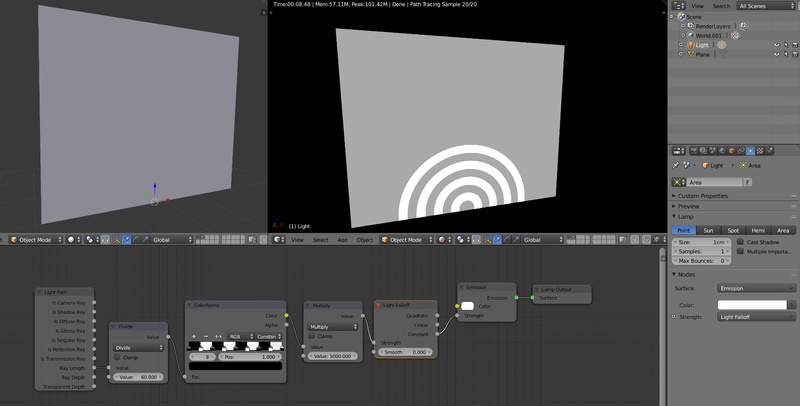 What the setup does is "normalize" the ray length to make the max length you want to control equal to 1. In the following image, the plane is exactly 5x5, so the falloff should be 2.5 units in order for the light to go off exactly before it reaches the edge. The ColorRamp factor input takes values between 0 and 1 while the ray length is in absolute blender units (length). So in order to use the ColorRamp we need to bring down the maximum ray length we want to control to correspond to 1. So, let's say we want to shine light up to 10 meters (or units), we'd need to divide Ray Length by 10, so that the end of the ColorRamp corresponds to 10 meters from the light source. The ColorRamp then assigns a color to each ray depending on their length. This result (which is a color - different for each ray) is plugged into the Emission color node so that we can pass color information in addition to strength. We still need to make the light falloff constant so that the default attenuation does not interfere (multiply) with the our gradient. So we plug in the Constant output of a Light Falloff node into the Emission Strength input. In the final setup, we control the distance by modifying the division value (2.500 in the screenshot above) and the strength by tweaking the Strength input (100.000) of the Light Falloff node. There is a light Falloff node. It controls how the intensity of the light fades away. Not the answer you're looking for? Browse other questions tagged cycles nodes light lighting or ask your own question. Is it possible to vary the material color by location for a fluid? How to make liquid's color intensity less, where the geometry is thinner? How does Blender lights work in Cycles regarding intensity? 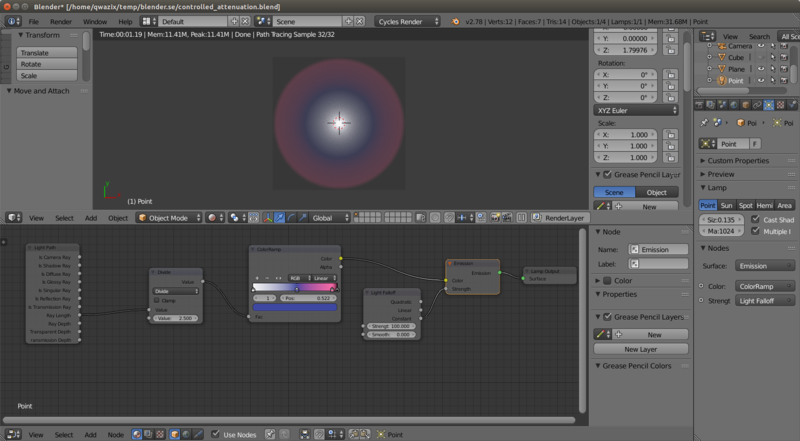 Blender 2.8: Where can I find light energy/intensity in Cycles?